Yes, I had heard about Wally (or Waldo as he is known in the US and Canada) for a long time now but I only knew about him in a very vague sense. I did not actually bother delving into the books until very recently. Target is selling this for $29 when the recommended UK retail price is £40!!! I actually already have the travel-sized pocket edition (which includes 7 of the 7 primary books) - except it is far too small. In the full-blown Where's Wally? WOW edition, however, each page is roughly A4 in size; each scene, or puzzle if you will, as far as I am aware comprises two pages. This edition makes for a great present for someone who enjoys wacky or novel things. The illustrations are gorgeous. The process of finding the items in each scene is not only challenging, but often results in you finding some hilarious items, people or events as well. As far as I am aware (I have not gone through all the books), each book provides you with a checklist of things to find . 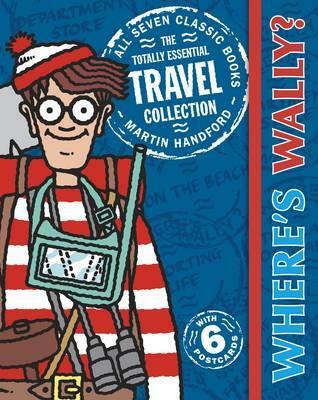 Apart from Wally himself there are other characters to find and, at least in the first book, Where's Wally?, there is also a recurring list of items to find in each scene (a key, a pair of binoculars, a scroll, a bone and a camera). There is something crazy going on in each page as well - usually ridiculous, hilarious or just weird things. Many of these crazy events or people are in the checklists of 'things to find' as well; however many are not and are left for you to discover on your own!! Curiously, I did stumble upon one or two items in the checklists that was open to debate - eg in the beach scene in "Where's Wally?" the checklist asks us to find something like "an odd couple" and "two odd friends". I found at least 2 or 3 "odd couples" so I was scratching my head as to which one was right! What does odd mean, exactly? Everyone looks odd!! The only downside to this WOW edition is that it does not contain the 7th 'mothership title' "Where's Wally? The Incredible Paper Chase". So bear that in mind if you buy this awesome title. This is a great Christmas present, in my view, for your fun-loving friend(s). Although I've not gone through all the books, I feel comfortable giving this a preliminary rating of 9/10. I think it is safe to say that Martin Handford is a creative genius.